Thank you for being a Major Gift donor! Your donation allows Hadassah to have a greater impact in the United States, Israel, and around the world, as we work together to empower women, advance health and well-being, and support Israel. If you would like to know your Major Gift pledge balance before you make your payment, please call Hadassah Donor Services 1-800-928-0685. Your payment will be applied to your oldest, open Major Gift pledge maintained at National Hadassah. To make a payment towards an open chapter pledge, please contact your chapter directly. IMPORTANT: If your payment is in excess of your oldest, open Major Gift pledge at National Hadassah, and you have other open Major Gift pledges at National Hadassah, then your excess payment will be applied in full to your other open Major Gift pledges at National Hadassah in chronological order. If there is still excess remaining after such application, or if you do not have an open Major Gift pledge at Hadassah National, then your excess payment or payment, as applicable, will be treated as an unrestricted donation. * A Major Gift is a gift of $5,000 or above. Please do not use this form for Annual Giving or Yahrzeit contributions. Your payment will be applied to your oldest, open, pledge, regardless of the Giving Page you are using to make the payment. Your payment will be applied to your oldest, open, pledge maintained at National. This payment option cannot be used to make a payments on any open Chapter pledge you may have. Your payment will be applied to your oldest, open pledge(s) maintained at National Hadassah, regardless of the webpage you are using to make your payment. To make a payment towards an open chapter pledge, please contact the chapter directly. 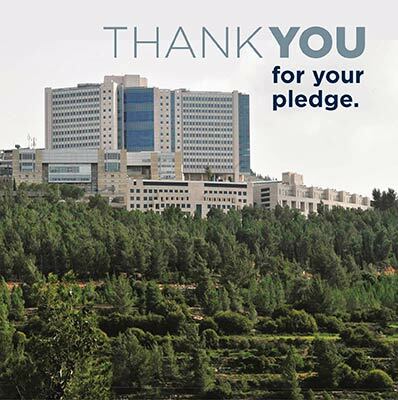 If you submit a payment for an existing pledge and (i) you do not have an open pledge maintained at National Hadassah or (ii) your payment is in excess of your open pledge(s) maintained at National Hadassah, then your payment or excess payment, as applicable, will be treated as a new undesignated gift to Hadassah. Charitable deductions are allowed to the extent provided by law. Hadassah intends to respect your wishes regarding this gift, however in accordance with U.S. tax law requirements regarding deductibility of contributions, Hadassah shall have full dominion, control and discretion over this gift (and shall be under no legal obligation to transfer any portion of a gift to or for the use or benefit of any other entity or organization). All decisions regarding the transfer of funds to or for the benefit of any other entity or organization shall be subject to the approval of the Board or other governing body of Hadassah. Payments of $20,000 or more may take 1-2 additional business days to be confirmed by your issuing bank.. If you are considering making a payment of more than $50,000, please contact our Hadassah Donor Services Support team at 800-928-0685, or email donorservices@hadassah.org.